Hunting dog, Companion dog, family dog, suitable to be trained for various purposes. Group 6: Scenthounds and related breeds. Section 3: Related breeds. Without working trials. The origin of the Dalmatian dog can be recognized in paintings and in church chronicles from the 16th to the 18th century. Dalmatians can be found on the altar painting "Madonna with Jesus and Angels" in the church "Gospa od andjela" in the town Veli Losinj, island Losinj in Croatia dating back to 1600 – 1630 and also in a fresco in Zaostrog, Dalmatia, Croatia. It suggests that the Dalmatian originates from the eastern Mediterranean region, in particular the historic province Dalmatia. The first descriptions of the Dalmatian were found in the diocese Djakovo, in the Croatia, namely in the church chronicles of the Bishop Petar Bakic from the year 1719 and the church chronicles of Andreas Keczkemety from the year 1737. The dog was named with the Latin name "Canis Dalmaticus" and the height of the dog described with 4-5 "Spithamus". Thomas Pennant described this breed in his work "Synopsis of Quadrupeds" in the year 1771 as very independent, named it "Dalmatian" and wrote the origin of this breed to be Dalmatia. A work by Thomas Bewick, published in 1790, refers to this breed as "Dalmatian or Coach Dog". 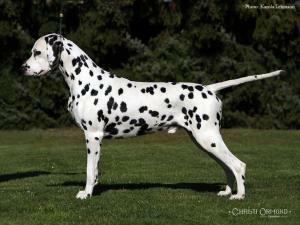 The first unofficial Dalmatian Standard was written by an Englishman named Vero Shaw in the year 1882. The FCI published the first Dalmatian standard on the 7th of April 1955 under the name of "Dalmatian Huntingdog". Mesocephalic. Head prismatic form with hanging ears. The body is rectangular, strong, muscled and distinctively spotted. The movement must be elegant. The sexual difference must be visible. Length of the body: height at the withers = 10 : 9. The height at the elbow joint: 50% of the height at the withers. The height the hocks: 20-25% of the height at the withers. Length of head: around 40% of the height at the withers. Length of skull : length of muzzle = 1 : 1. The head must be in proportion and harmony with the rest of the body and not too wide in the skull area. The length from the occipital protuberance to the stop and from the stop to the tip of the nose equals 1:1, or the muzzle is slightly shorter. The upper line of the skull and the upper line of the muzzle are slightly divergent. The masseter muscle and the cheek bone must not be too developed. The head must be entirely free from wrinkle. Flat, with a slight lateral rounding. Broadest between the ears and well defined temples. Slight frontal furrow. Stop: Moderately defined. Large with wide open nostrils, it must be completely pigmented. The colour must be in accordance to the colour of the spotting. Well developed & strong jawbone, nasal bridge straight. Strong, must fit the jaw rather closely and not be pendulous, or too thick; without the corner of the mouth too defined. A complete pigmentation is desired. Scissor bite, i.e. the upper 6 incisors closely overlapping the lower teeth, with all teeth set square to the jaw. A complete set of teeth (42 teeth) is desired (in accordance with the teeth formula). The teeth are evenly formed and white. A pincer bite is tolerated in older dogs. Oval, in a sub-frontal position placed at an angle of 10-15˚. The eye colour is in accordance with the spotting. Eyelids are close to the eyeball and not loose. Eye rims are completely pigmented in accordance with the coat colour. Set on rather high, carried close to the lateral part of the head. The length reaches to the inner corner of the eye or to the stop. The tip is slightly rounded. The ears have the shape of an isosceles triangle. They are fine in texture and soft to the touch. It is very important that the ears are spotted, i.e. the ears must not be completely black or brown but black or brown spotted etc. with the spotting in accordance with the colour variety on the white base. Rectangular, proportions of length of body to the height at the withers is 10: 9. Withers: Well defined. Back: Powerful, level.Loin: Short and muscular. Croup: Muscular, inclined less than 30°. Chest: Deep and capacious, not too broad or barrel-shaped. The depth of the chest should be 45-50% of the height to the withers. The height of the elbow is 50% of the height to the withers. The ribs are well sprung. Underline and belly: The belly is moderately tucked up but not drawn in. General appearance: In proportion to the body. With strong well developed muscles. Hindlegs are parallel. Thigh: Muscular and strong. Hair: Short, shiny, hard and dense all over the body. Colour: The ground colour is pure white. Black spotted variety with black spots, liver spotted variety with brown spots. The spots should be symmetrically placed all over the body, clearly defined and without intermingling into the white ground colour. The size of the spots should preferably be even, with a size of 2 – 3 cm in diameter. In the brown variety the spots are a little smaller, around 2 cm. The spots on the head and on the legs should be proportional smaller than on the rest of the body. It is desirable the tail is spotted too, with spots also proportional smaller that those on the body. Splashes on the body are not desirable and should be penalised. The spots must not intermingle, i.e. forming large patches. Patches and coloured areas are not desirable. The spots on the ears should be especially noted. Height at the withers: Males 56 – 62 cms. Females 54 – 60 cms. Dogs with excellent type and balance should not be penalised if above the upper limit. The lack of more than 6 premolars, the lack of M3 is not noted and will not be considered as a fault. Entropion, ectropion, wall eye, eyes of different colours (heterochromia), blue. Monocle (patching around one or both eyes) or patching elsewhere. Tricolour (black and brown spots on the same dog), brindle coloured spots, lemon coloured spots, orange coloured spots, blue spots and pure white colour without spots.